It’s winter, and with the cold weather and darker days it’s not unusual to feel a bit down in the dumps. That is how I was feeling when I went to see The Hobbit: An Unexpected Journey but it succeeded in lifting my spirits. It is the story Bilbo Baggins, a fussy, stay-at-home Hobbit who has barely been beyond his front door, that is until Gandalf the wizard volunteers him to join an adventure with 13 Dwarves as their ‘burglar’. It is a feel-good film with a lot of humour and a satisfying conclusion, even though it is the first instalment of three films. Bilbo Baggins is going on an adventure! Yes! Three Films! And three very long films. As you may already know the original Lord of the Rings books were a trilogy whereas The Hobbit was but a single book, so in the movies The Lord of the Rings had to be cut down, conversely The Hobbit needed to be expanded. It appears they have done this by assuming a more leisurely style of story-telling, taking time over the little things (pun intended), and adding things LOTR was forced to cut. Radagast, played by Silvester McCoy, is an example of the latter, playing quite a significant role. He not only helps the heroes but provides some important information foreshadowing future instalments. A wizard like Gandalf he is an eccentric nature-lover who lives on the edge of Mirkwood (which the dwarves travel through later) so the characters meeting him does not seem far-fetched. Radagast has a birds nest in his hair and rides a sled pulled by super-fast ‘Rhosgobel’ rabbits – sure to be a hit with the kids! An Unexpected Journey feels a lot more like a children’s story; it is more innocent, but this is appropriate. The Hobbit was written as a children’s book and the characters are quite niave, especially Bilbo, the fish-out-of-water. The theme is that little things are important, and throughout you see small things being dismissed or overlooked which (if you’ve seen LOTR) you will know are actually of huge importance! It’s been done in a way which adds to the humour as the viewer can smile knowingly. The movie is very comedic throughout with the Dwarves clowning around, lots of witty banter and even some funny villains! Gollum makes an appearance and his schizophrenia is wonderfully acted by Andy Serkis. You will be laughing the whole way through. The action is possibly the films weak point. Visually they are very impressive, as we might expect, but it is quite confused and difficult to tell what is going on. This is in part due to the fact there are so many dwarves it is hard to distinguish them so the whole thing becomes a scrum. The battles also seem to involve an incredible amount of luck on the heroes side, not to mention cartoon physics, which damages your suspension of disbelief so there’s never a sense of real danger. There are some big falls, for example, which the characters could not realistically survive (although Bifur appears to have an axehead buried in his skull so perhaps Dwarves are just that indestructible). Amongst other things the Dwarves sing for their supper! The acting is brilliant and the actors are wonderfully cast. Ian McKellan reprises his role as Gandalf and you will also see the return of Cate Blanchett as Galadrial and Christopher Lee as Sauruman. You also see a bit of Ian Holm as old Bilbo and Elijah Wood as Frodo during the introduction, however this is the part of the film which drags the most in my opinion, feeling a lot like a) filler and b) pandering. Once the film moves on to the ‘real action’ however it never drags despite its length. Martin Freeman plays young Bilbo entertainingly and believably and at no point did I think “that’s not Bilbo”. Richard Armitage as Thorin Oakenshield does a weighty performance as leader of the Dwarves; his relationship with Bilbo is a subplot of the film. 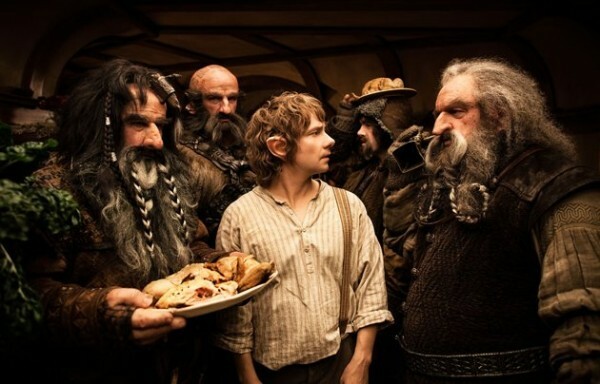 He is doubtful of the Hobbit, telling him he does not belong and is a liability, and it is these doubts Bilbo must face. 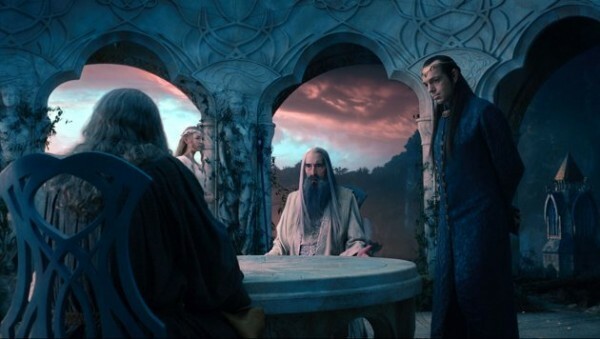 Familiar Faces: Elrond, Galadrial and Saruman return in The Hobbit. Alan Lee, one of my favorite artists, was the conceptual designer on An Unexpected Journey and I can’t do anything but love the visuals. Besides him there was a huge teams of artists and craftsman who should all be extremely proud. The costumers and make-up artists did a fantastic job of giving each dwarf their own individual look. Of course The Hobbit: An Unexpected Journey is ground-breaking in that it is the first film in cinema history to be filmed at a frame rate of 48 frames per second. It was a big improvement in my opinion, especially for 3D which generally tends to look a lot less distinct than it’s 2D counterparts. It does take a bit of getting used to; it is a hell of a lot clearer and we are not used to seeing that on-screen. Personally I found myself being distracted by mundane things like the stitches on a jumper, because usually you just don’t see them! But because it is so sharp it is a lot easier to pick out the fake stuff like CGI, which might be a disadvantage for a fantasy film I guess! I will conclude by saying the Hobbit is an uplifting movie full of fun from start to finish. If the film-makers are milking the Tolkien franchise I say milk away! More please.